I’ve read quite a few of Stephen King’s books, but never got around to reading this until now. No reason, specifically, unless it’s the fact I read ‘salems Lot (Number Two) and thought it was clumsy and hard going. What a surprise Carrie is then, in comparison. Carrie herself and Sue Snell, really the main two characters, are well thought out and three-dimensional, and I really felt for Carrie and her miserable life. And for Sue as well, trying to reach out to her in anyway she could. The fact that she left it too late is the real heart of the story, and the tragedy of it all. King’s first book is a short tale compared to most of his others, and there’s none of the bloat that affects some of his later writing. The climax is slow and inevitable, but unaffected by that slow build. The book slips between the main events and the aftermath easily, lending a nice feel to it and breaking up the linear narrative. I can see why King became such a popular writer after this. This isn’t a story of the boogie-man who eats children or vampires coming to town. This is an ordinary girl with an extraordinary talent; her only response to bullying is to fight back the only way she knows how, with terrifying and bitter results for the town where she lives. 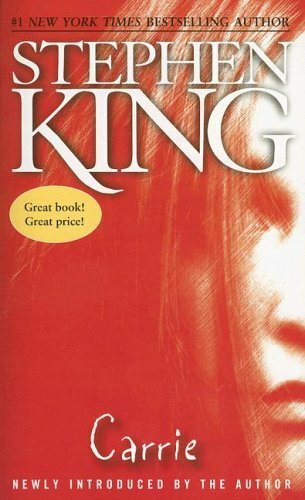 Extraordinary, and without doubt one of the top three King books I’ve read. This entry was posted in Reviews and tagged 4/5, Carrie, review, Stephen King, tony talbot. Bookmark the permalink. ← Book Trailers – Worth it?